They have been called the “The Dream Team” and were declared by the Washington Post “one of the gold-plated names in chamber music”. But these statements seem inadequate when you consider the American first violinist Ralph Evans was a prizewinner in the International Tchaikovsky Competition, the “fiercest, sweatiest, most nerve-shredding competition in the classical world”; that Russian-born second violinist Efim Boico was chosen by Daniel Barenboim to be concertmaster of the Orchestre de Paris, that Canadian violist Juan-Miguel Hernandez recorded with Norah Jones and Chick Corea and the British cellist Robert Cohen, in the words of New York Stereo Review, “plays like a God”. Despite their unique and diverse musical makeup and the individual impact each artist has had on the world of music, there is an overwhelming force that drew them together and marks the Fine Arts Quartet as a musical entity like no other. They have an instantly identifiable sound, an intense beauty, a deeply warming, fluent communication that envelopes their audience. It has been called a sound from the golden era, a sound that restores and enriches. The Fine Arts Quartet holds an extraordinary and legendary history of its own. Founded in Chicago in 1946, they have recorded over 200 works and toured throughout the world. The thirty-two year membership of Evans and Boico has created a unity of violin sound like no other. Three years ago, Cohen brought his extraordinary musical passion to the Quartet, followed shortly by Hernandez with his dynamism and heartfelt warmth. 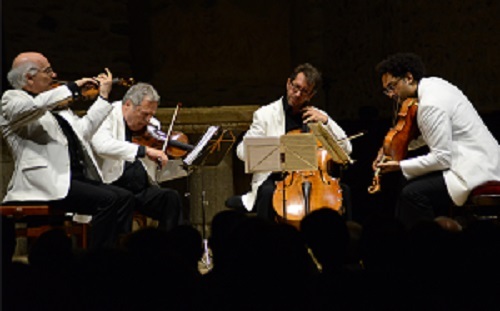 The Fine Arts Quartet are an inspiration to young chamber ensembles and have nurtured many of todays top international quartets whilst teaching as guest professors at the major conservatoires of Paris, Lyon, Lugano and London. They are Artists-in-Residence at the University of Wisconsin-Milwaukee and give masterclasses at summer schools in the US and throughout Europe. They also go into the heart of communities, introducing music with flair, humour and passion to school children, demonstrating close-up their excitement and love for the music and their instruments. Fauré Quintets with pianist Cristina Ortiz “Gramophone award-winner and recording of legendary status” (Gramophone Magazine). Franck Quartet “Editor’s Choice” (Gramophone Magazine). Glazunov, Mendelssohn and Fauré CD’s were each “Recording of the Year” (Musicweb International). “Four American Quartets” album “BBC Music Magazine Choice”. Schumann “one of the very finest chamber music recordings of the year” (American Record Guide). Mozart Quintets “Critic’s Choice” (American Record Guide). CMA/ASCAP Award for Adventurous Programming ((contemporary music), given jointly by Chamber Music America and the American Society of Composers, Authors, and Publishers. Many of the Quartet’s Naxos recordings have been selected for Grammy® Awards entry lists in the “Best Classical Album” and/or “Best Chamber Music Performance” categories. Recent special projects include the Mozart-Lachner project, recording two Mozart piano concertos in Ignaz Lachner’s 19th century chamber transcriptions for piano, string quartet and bass, with the wonderful pianist Alon Goldstein. A monthly WUWM National Public Radio series by Cohen called ‘On That Note’, and the creation and development of ‘Musical Heights Foundation’ by Hernandez, a nonprofit foundation bringing high-level musical teaching into developing countries.